Association Mitsinjo is a community-run conservation organization which operates around the village of Andasibe in east-central Madagascar. This area is particularly rich in frog species, with over 100 found within a 30 km radius of town. 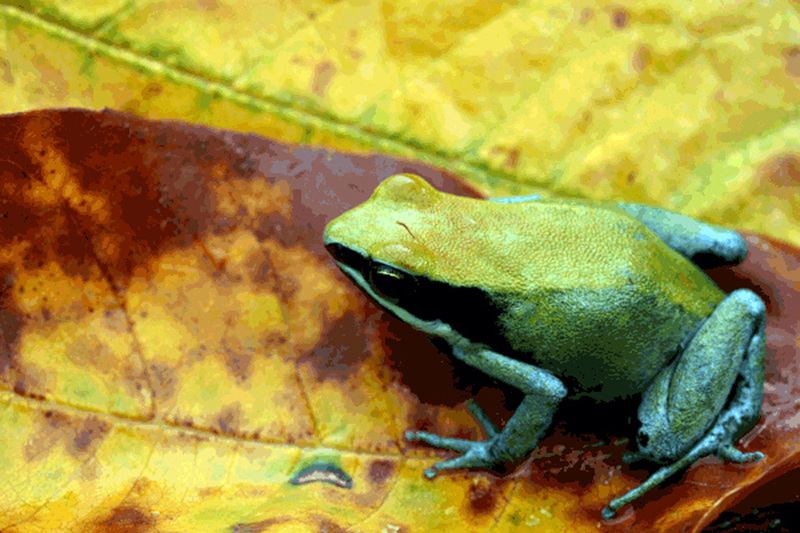 Familiar frogs found in habitat managed by Mitsinjo include the Critically Endangered golden mantella (Mantella aurantiaca), Endangered yellow mantella (M. crocea), and the marbled hopper (Scaphiophryne marmorata). As part of Mitsinjo’s amphibian conservation program, the association is developing a captive breeding center and training its members in amphibian husbandry. This project is in collaboration with the Amphibian Specialist Group of Madagascar and Direction Générale des Forêts. The captive breeding facility was constructed between November 2010 and March 2011 with support from the Association of Zoos and Aquariums Conservation Endowment Fund. It measures 185 square meters, and contains separate biosecure rooms for culturing live foods, maintaining captive assurance populations of local threatened frog species, conducting husbandry research, and for quarantine and isolation. As of summer 2011, technicians are gaining firsthand experience maintaining four locally abundant frog species through a husbandry research and training project supported by Cleveland Metroparks Zoo and Tree Walkers International. Already, one species (Mantidactylus betsileanus) has repeatedly bred, with technicians successfully raising tadpoles to frogs. Additionally, locally-sourced invertebrates including three cricket species, a Collembolan, and a fruit fly are being cultured in quantities large enough to support the captive frog populations. Goals for the project through the last half of 2011 and into 2012 include establishing colonies of additional local live food species, collaborating with the University of Antananarivo to exchange experiences culturing invertebrates, securing an alternate source of water and electricity for the facility, and developing a conservation breeding program for local threatened frog species. Association Mitsinjo is also working to develop an educational center for the residents of Andasibe and tourists, which will educate the public about local amphibian species and the threats they face. Support for the project has been provided by Amphibian Ark, the Association of Zoos and Aquariums, Conservation International, Durrell Wildlife Conservation Trust, Tree Walker’s International, American Frog Day, Woodland Park Zoo, and Cleveland Metroparks Zoo. To help support this important amphibian conservation initiative, Understory Enterprises is donating 15% of its captive-bred mantella sales to support Mitsinjo’s project. These funds will be used to pay locally-hired amphibian technicians a skilled workers wage and to supply the facility with much needed materials used for maintaining captive frogs.